The lovely ladies at Philly Food Lovers invited me to Down Home Diner at Reading Terminal Market to have lunch. I made it a point to not go during the peak lunch hours, but it was still really crazy busy in there! We got a seat in one of their booths, but everything else was full! Jack McDavid servers up home style cooking with a southern twist here. He famously wears denim overalls and a red and white “Save the Farm” trucker’s cap and is super nice. I got a chance to meet him and he certainly serves up some great food. 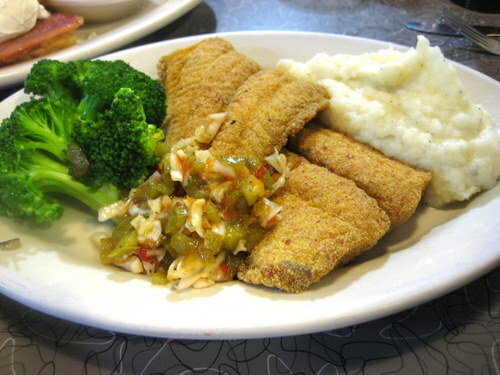 K got the fried catfish with mashed potatoes, broccoli, and philadelphia style pepper hash. This hash is amazing! It’s a sweet and sour slaw of cabbage and bell peper with just enough spice. It would go well with anything! 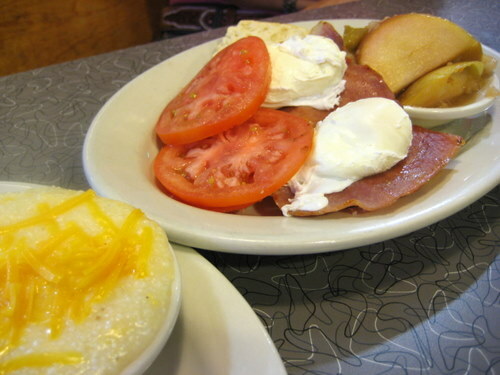 Here’s C’s Poached On A Biscuit… homemade buttermilk biscuit topped with salt-cured virginia ham, sliced tomato, and two poached eggs. There’s some stewed apples to go with those too. And she also got an order of cheesy grits. After she let the grits sit for awhile, they were just the way she liked them, not too mushy. And here’s my Cast Iron Fried Chicken with mashed potatoes and collared greens. This is a whole lotta chicken that is super hot, super moist, and perfectly fried up. You know what goes really well with it? The philadelphia style pepper hash! And it was even better the next day as leftovers! The sweet potato fries were also amazing, and I think they are twice fried. 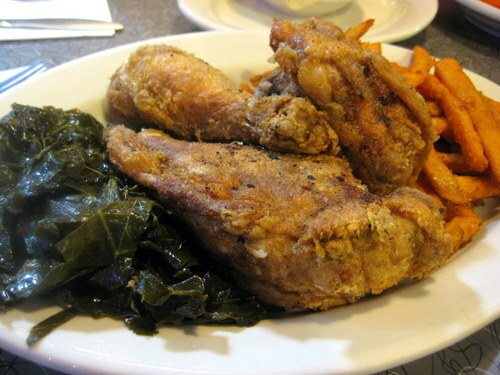 But the real star of this plate was the collard greens. They are braised and are sweet and savory and not bitter at all. These are some of the best greens I’ve ever had! This was a fun and delicious lunch with some amazing women and tons of delicious food. I need to eat in the city more often!